Louise Green is a fitness activist, global coach and author of Big Fit Girl. For the past decade Louise has tenaciously dedicated her energy and voice to disrupting the fitness industry by leading a counter-culture movement for women to unleash their inner athlete, at every size. 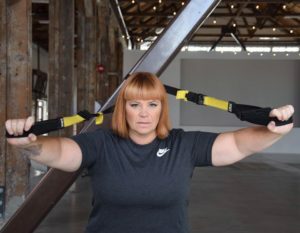 Green Founded the first fitness company in Canada specifically dedicated to larger women where she coached thousands of women to break down barriers and smash stereotypes while tapping into their physical power. She has since broadened her reach by creating online fitness programs where she now coaches women from around the globe. Through her movement, Green has been named one of the Top Trainers to follow by Self Magazine (2017 & 2018), listed by Women of Influence as Five Canadian Women Boldly Changing the World for Women and Girls and noted as one of the Top One Hundred Health and Fitness Influencers by Optimyz Magazine. In 2017 she launched her book, Big Fit Girl, and changed the fitness landscape at books stores around the world. Personally, Green transformed from a chronic, all or nothing, dieter to an unstoppable force changing fitness culture single handedly. She fiercely dedicates her time to coaching women to change their lives through endorphins not weigh-ins. Green also shares her voice through her column, Big Fit Girl, at Self Magazine and lobbying for better media representation for size diversity in fitness and sport. Green’s message has reached some of the the biggest media outlets in the world where she’s been interviewed at NBC at the The Steve Harvey Show, London’s BBC, The Wall Street Journal, UK’s ITV and the Australian Morning Show. Louise spends her spare time with her son and husband and by living by example while training for her first Half Ironman.